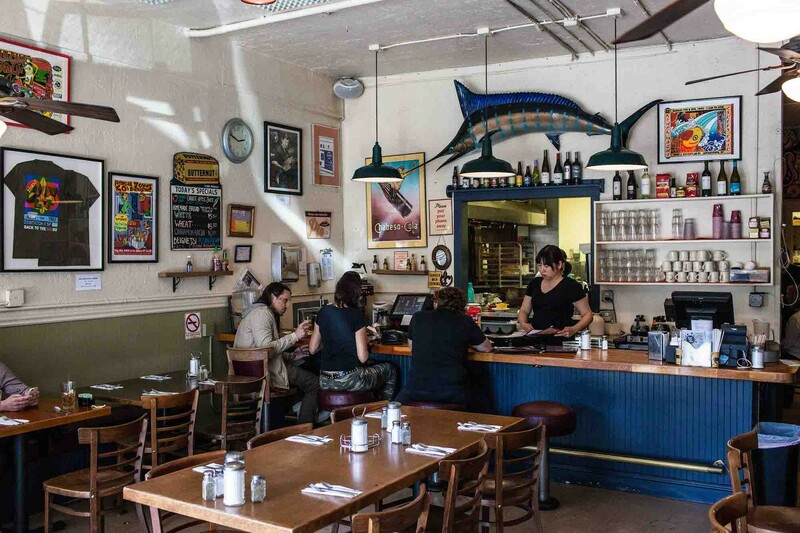 This cafe is indeed Just For You if you’re craving basic Americana brunch. There may in fact be a dinner menu, but we’ve never heard of anyone trying it. Seriously — we defy you to find a picture of anything other than carb and egg products on the internet. And if it isn’t catalogued in a picture on the internet, it doesn’t exist. So how is the chronic brunch? Hangover-friendly, to be sure. There’s all manner of pancakes, French toast, and combinations thereof, especially designed to rescue your body from its deep dark place. If you’re feeling “healthier,” there are at least a dozen egg options. What did you expect? Just For You does serve two items worth talking about, both of which bring it into direct competition with the other NoLa-style brunch specialist in town, Brenda’s. First, the beignets. Just For You goes for a lighter, airier style, which is truer to the Bayou standard, Cafe Du Monde. But are they strictly tastier than the crazy crawfish/chocolate/apple pie concoctions of the competition? Sadly not. The Hangtown Fry, however, is vastly superior. The oysters are actually fried up like little seafaring chicken bits, and they are dang good. This dish is in theory an SF signature (yet it’s hard to find), and this is the best version we’ve had in town. - Craving a basic, but tasty, breakfast. Little cloudy puffs of sugary fryer oil. People love ’em. These are the most normal delicious versions of these slices of America you can imagine. Picture pancakes in your mind. These are those pancakes. A solid egg concoction with vegetables (perish the thought), cheese, and meat of your choice. It’s a bunch of eggs with mix-ins. You’ll like it. A fried oyster omelet. You have to try this once if you live here, and this is the best classic version.